The beauty industry is booming these days. This makes it a great time to get into the business, or expand your existing business. There are plenty of ways to do so, but today we’re going to talk specifically about becoming a mobile hairdresser. Keep in mind, though, that the advice here can easily work for other mobile beauty businesses like nail technicians and makeup artists. But before we get into how to start a mobile hair salon, let’s talk about the whys. No rent – If you open a mobile beauty business, you don’t have to rent a space for your salon. Instead, all you need is a bag to hold your equipment. You don’t even need a car, though depending on where you live, it can be more convenient than a taxi or bus. You’re your own boss – The hours you work are up to you. That means no more scheduling shifts, or being available on the days your employer wants. You set the rates and get all the money – When you set up your own mobile barbershop business, you get to set the rates. That means you charge what you think your services are worth, and keep the full amount. You’re always on call – You may not have a boss telling you when to come in, but you have a personalized service. This means you will often feel pressure to be available when clients want. And this often includes evenings and weekends. Drumming up business is up to you – As with any business, when becoming a mobile hairdresser, the responsibility is on you to build your client base. If you don’t bring in customers, you don’t get paid. The fear factor – Working with strangers can be scary. You may want to be selective in the customers you take, to protect yourself. For example, you may decide you want to work only with women, at non-smoking homes, or places without dogs. There are a number of key elements that go into becoming a mobile hairdresser. Obviously you’ll need skills and drive to start with. But you’ll also need to consider some business necessities. 1. Choosing your business structure – There are two basic ways to run a mobile beauty business. You can choose to put your business on wheels, running a mini salon out of a van. Or you can take regular transportation to customers’ homes. There aren’t a lot of other options, besides occasionally renting space in a salon that allows for that arrangement. 2. Taxes and employment status – As a mobile beauty business owner you will be self-employed. This means you will be in-charge of dealing with your own taxes, which will include payments for income taxes, Medicare, and social security. You will also be able to deduct all sorts of expenses like your equipment and travel. If you can afford to, it may be worth hiring an accountant to help you out. If not, make sure to organize your paperwork well, and read up on your tax status. 3. Insurance requirements and options – You will also need mobile hair and beauty insurance to protect your business. Your mobile beauty insurance should be a combination of general and professional liability. More importantly, it should be tailored to your unique line of work such as nail technician, cosmetologist, or in our case, hair stylist. You can also get mobile beauty therapist insurance as well as mobile hairdresser insurance, as each will need to be tailored for your protection and personal situation. It should cover you for all sorts of unforeseen events including someone slipping on the floor of your mobile salon, accidental damage to a customer’s carpet with hair bleach, or the aforementioned customer’s trip to the ER for stitches. Of course, if you’re driving from place-to-place to reach customers, don’t forget commercial auto insurance! Becoming a mobile hairdresser is one thing, and figuring out how to start a mobile hair salon is another. Once you get started the real work begins. Social media – Facebook, Twitter and Instagram are the obvious choices. Just remember, in order for social media to work you need to update your account regularly, especially with pictures. You should also be responding to all comments and messages to show your active interest. Newsletter/Blog – Lots of customers love getting beauty tips. Position yourself as a pro by writing about what you know. For example, you can create a blog and write an article on hair care and styling tips once a week. You can then leverage that content, sending a newsletter link to people on your mailing list. Beyond showcasing your expertise, this is a great way to remind customers of your service. Useful giveaways – Leave your mark in each customer’s home with a cute giveaway. Nail technicians, for example can leave a branded nail file. 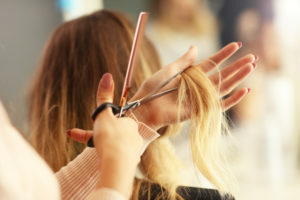 A hair stylist could leave a comb or brush with your contact details. Of course, there are many more ways to market your mobile beauty business once you get started, from word of mouth to radio ads. Just make sure to keep an eye on your budget and your goals. Then feel free to get as creative as you want.